"This dish is colorful and the ingredients prepared ahead of time. Your family and friends will love this recipe! Note: the most time consuming part of this recipe is making the paste for the sauce (it gives an unique flavor and is worth the effort). The paste can be made ahead of time and stored in the fridge. Bring to room temperature before adding to the sauce. 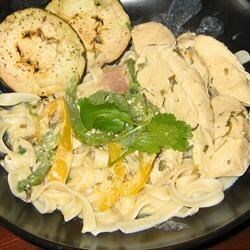 Serve with your favorite noodles (1b of dry) or with mashed potatoes (5 medium.)" Heat 2 tablespoons of butter in a small saucepan over medium heat. Add garlic and jalapeno, and saute until soft. Pour in chicken stock, tequila, and lime juice. Bring to a boil, then lower the heat and simmer until the mixture is reduced to a paste, about 15 minutes. Stir occasionally to make sure it is not sticking. While the sauce is cooking, place the chicken in a bowl, and pour soy sauce over it. Melt remaining butter in a skillet, and saute the onion, red bell pepper and green bell pepper until soft. Remove vegetables, and set aside. Add oil to the skillet, and cook the chicken over medium-high heat until lightly browned. Pour in the sauce and heavy cream, and add the peppers. Bring to a boil, and simmer until chicken is cooked through, about 5 minutes. Remove from heat, and stir in Romano cheese and cilantro. Taste and adjust seasonings if desired. Serve immediately. Even my picky son likes this one. It took me 30 minutes to thicken the sauce, but it turned out great. Served with Mexican rice and corn. Whew! Can I say YUM!!!!! Served this dish over rice, it is a keeper.